Random House Trade Paperbacks, 9780375759932, 240pp. Breathtaking in its suspense and beauty, Carry Me Across the Water is the story of a man’s turbulent journey, with his family, through the central years of the twentieth century. Young August Kleinman escapes from Nazi Germany to America, where his mother’s words—“Take the advice of no one”—fate him to a life of boldness and originality, from the poor streets of New York to the marble mansions of industrial Pittsburgh, from old world Hamburg to the jungle islands of the Pacific. Ultimately, near the end of a long and bountiful life, his resolution of a haunting encounter with a Japanese soldier during World War Two finally illuminates, at the deepest levels, the way authentic lives truly unfold. From the writer hailed as “the most mature and accomplished novelist of his generation” (Alan Cheuse, National Public Radio) comes this “exquisitely modulated short novel” (Los Angeles Times), which “eases its silky-smooth way into a reader’s consciousness even as it plumbs the depths” (Newsday). 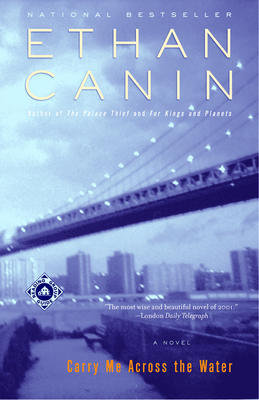 Ethan Canin is the author of For Kings and Planets, The Palace Thief, Blue River, and Emperor of Air. He is a graduate of Harvard Medical School and on the faculty of the University of Iowa’s Workshop. He lives in California and Iowa.